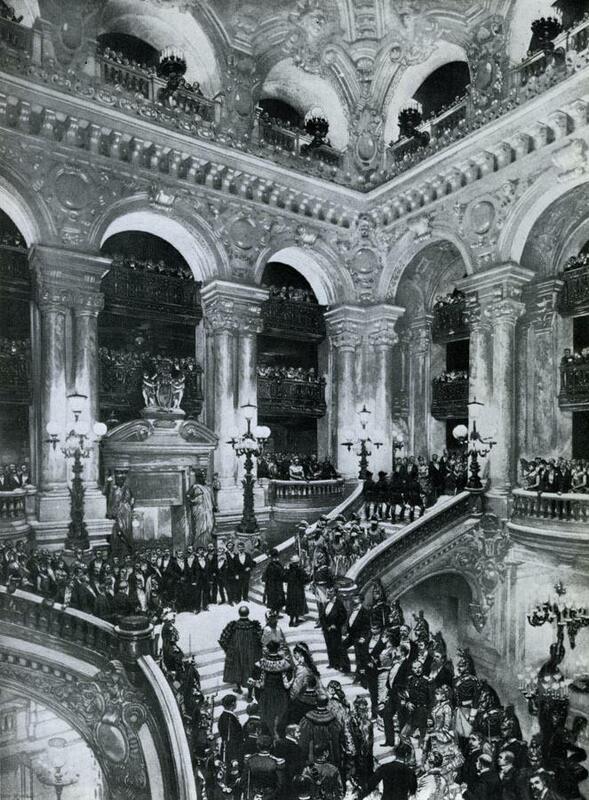 It is said that the emperor Napoleon III said astonished to Charles Garnier, the young architect of the new Paris Opera (1861-1875): “It looks like you’ve designed this theater only for its interior stair!”, admiring the large two-flights open stair leading to the side balconies, conceived as authentic stages for the distinguished guests at the opening ceremony, namely as elements of an “additional theater”: that of the high society of the Second Empire. An impressive stair (about 30 meters high! ), a triumph of gilding and polychrome marbles. 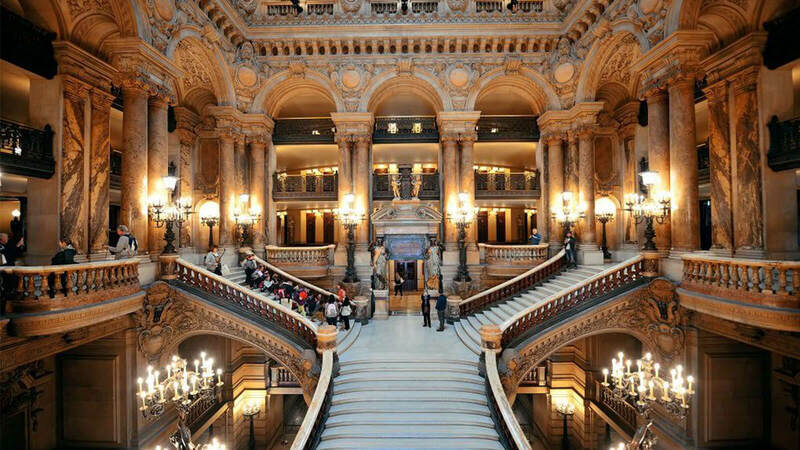 Opulent and decorated like a wedding cake full of profiteroles, the Palais Garnier picked up the Sun King’s lesson to celebrate the ruling class, but somehow it remains an amazing sight… even for us. As a leading company in the decor sector, Executive Stairs supplies luxury staircases, providing ad hoc solutions to customers. Our design concept is an ideal blend of professional performances and client wishes: an original Italian point of view in the field of interior design. Our watchwords: imagination, creativity, competence and passion. And what a sea it is! We are in Positano with a client, an American lawyer who chose one of our interior stairs for her house: Brera. 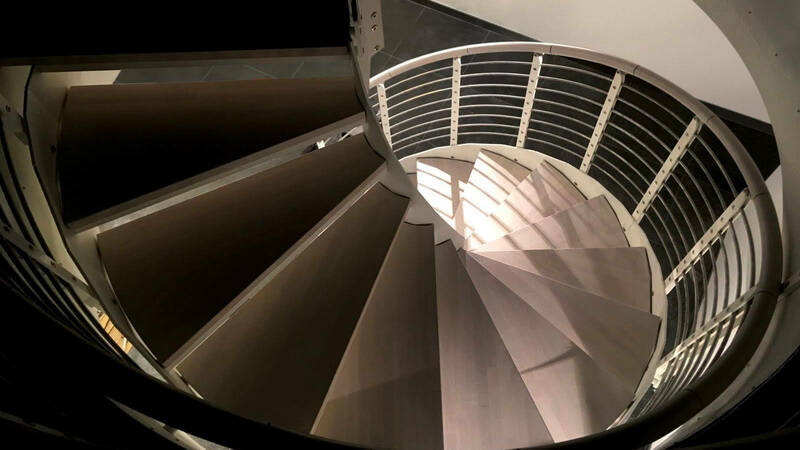 Brera is a stainless steel stair that the client wanted to enrich with a chic polished finishing and glass steps: a modern and decorative stair going beautifully with the interior design. Here’s a good example of “total white” style: that of the French designer who chose Concrete—from our helical stairs line—to decorate a luxury apartment in the heart of Paris. What he was looking for, he told us, was a masonry stair which was also a design stair. He opted for an achromatic finish, thus perfectly integrating this beautiful cement stair into the “total white” decor. 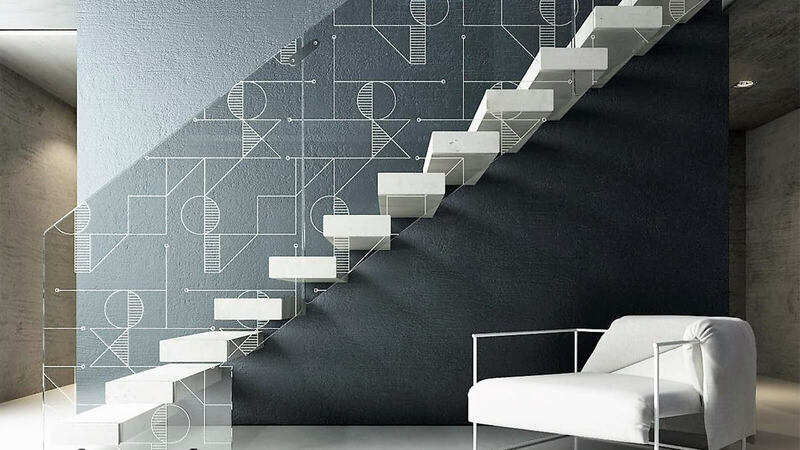 Concrete is actually one of the most popular decorative stairs of our collection: an interior stair combining minimalism and charm, a modern stair but with a timeless glamour. Paris: on the outside the green of a garden, framed by a large window, and inside a Brera steel stair with a double black structure and steps made of extra-clear glass (a public use stair, being installed in an office building). 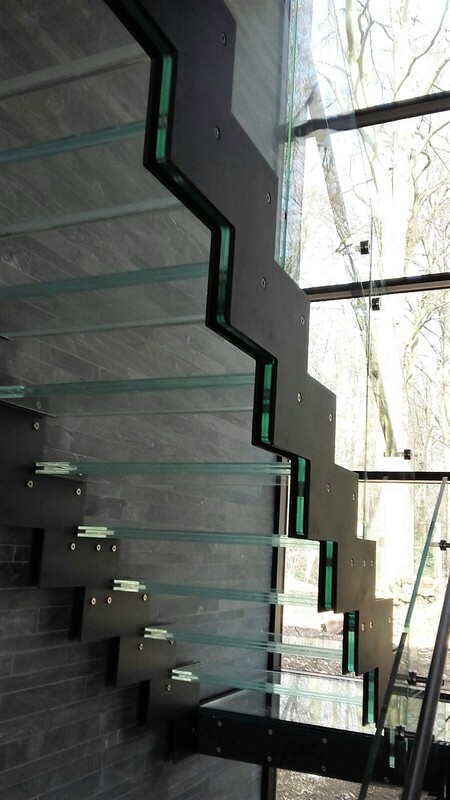 We love this interior stair project because of the correspondence of spaces created by the window and the steps, whose glass allows light and gaze to pass through. 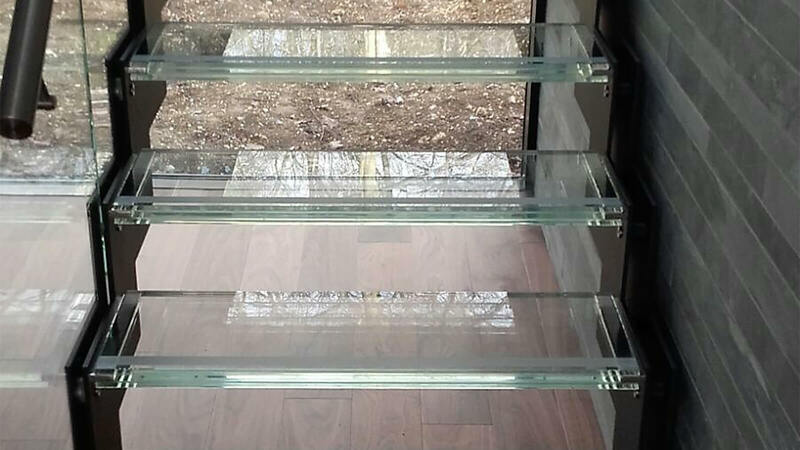 So the right choice of finishes is confirmed as a crucial factor to get a unique design solution, that is a perfect custom stair. In this case, the black chosen for the coating of shanks contributes to making the functional stair conceived by the designer also a true decorative stair. 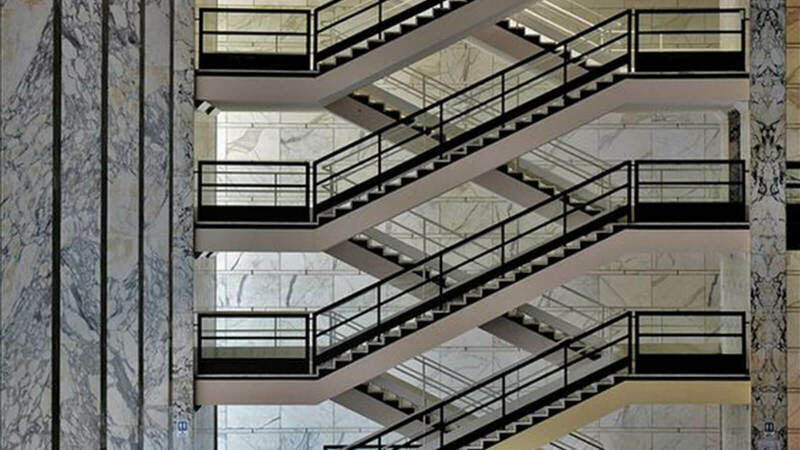 Here is another masterpiece: the interior staircase of Palazzo dei Congressi in Rome (EUR district), built between 1939 and 1954 according to the design of Adalberto Libera (1903-1963), one of the many great architects of Italian Rationalism. It is an open staircase of impressive beauty that acts as backdrop and “vertical extension” to the atrium, shaping the series of pillars in another direction: a focal point, a light source able to reconfigure space into a new and seductive complexity. The materials of this wonderful staircase are those used by Libera for his Palazzo, with the same felicitous inspiration. Let’s talk again about interior stairs and specifically about Teorema, a floating stair of our Decór collection, designed by Carolina Melis. Here it is in its amazing “total white” version in which the white covers the lacquered wood steps and traces the decoration drawing, so that it clearly stands out against the dark background. A very refined combination enhancing the elegance of this wall stair as well as the fantasy of its Deco patterns, far from any standard symmetry and modular repetition. We believe Teorema is one of the most beautiful design stairs in the Executive collection, and we are sure that you too will appreciate it as a genuine “author stair”. 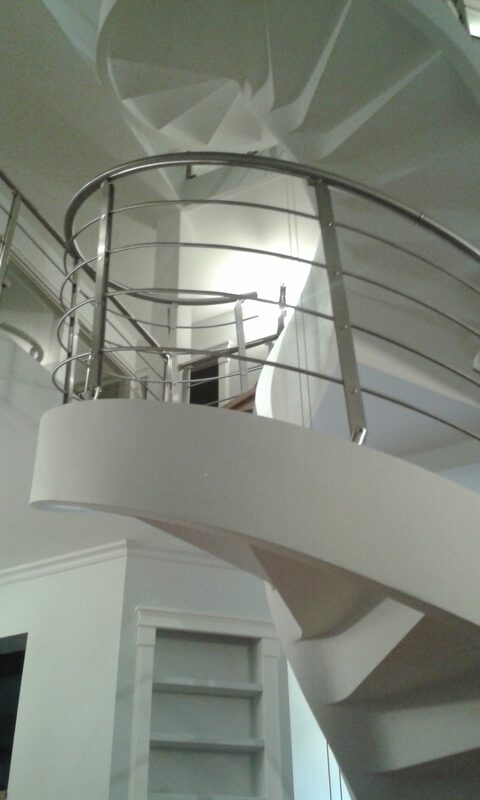 Helical stairs: now available also in cement version! Concrete is a cement stair with a sinuous helical shape but no central pole (unlike spiral stairs). Customers and designers choose this decorative stair for its understated elegance, especially appreciable in the version with cement railing. However, there are other possible versions: the one we are proposing here is with stainless steel pillars for the railing and wenge finishes for the steps. 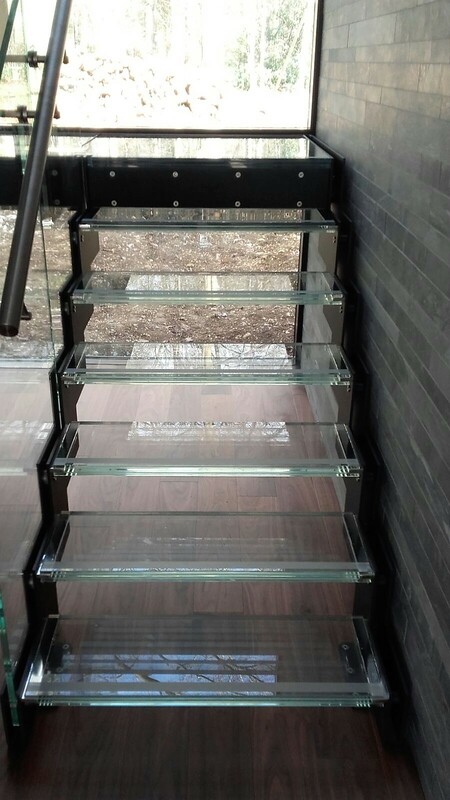 It is a model installed in a private house, since Concrete is conceived as an interior stair and not as a public use stair (for this last requirement, you can consult our stainless steel stairs catalog). In conclusion: if you want a masonry stair that is also a design stair, Concrete is just what you need! Work in progress in a client’s house, where we are installing a Line helical stair, one of the most popular in our design stairs collection. 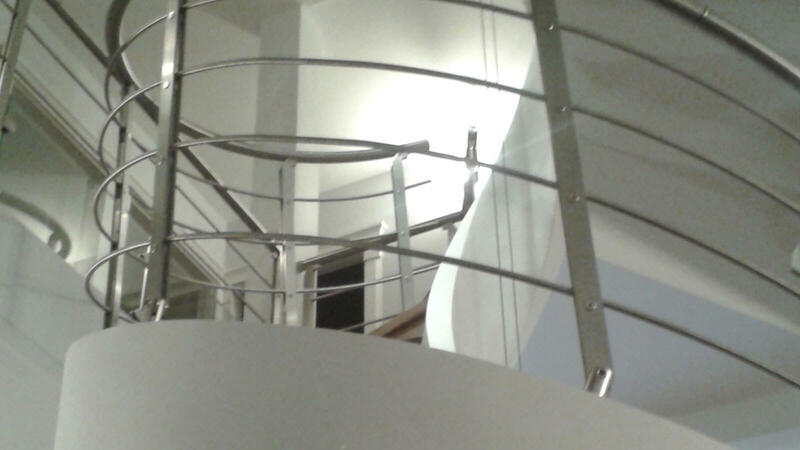 It is a steel stair, also available in the polished or satin stainless steel version. 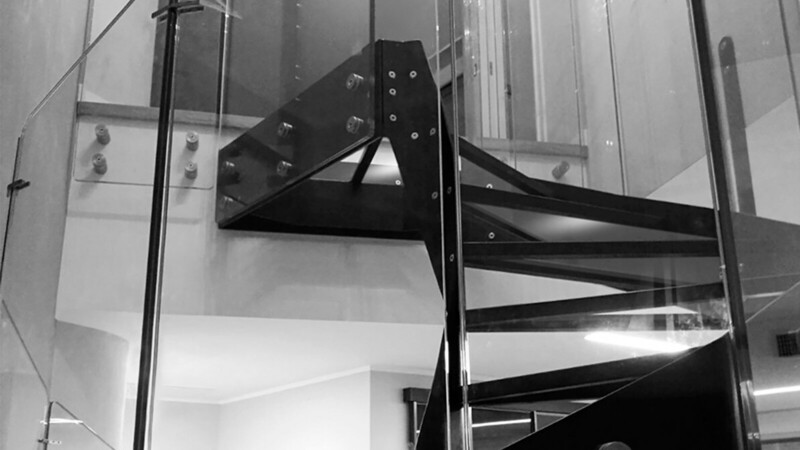 Our client has required, however, a black covering finish, in order to give his interior stair a stronger visual impact. 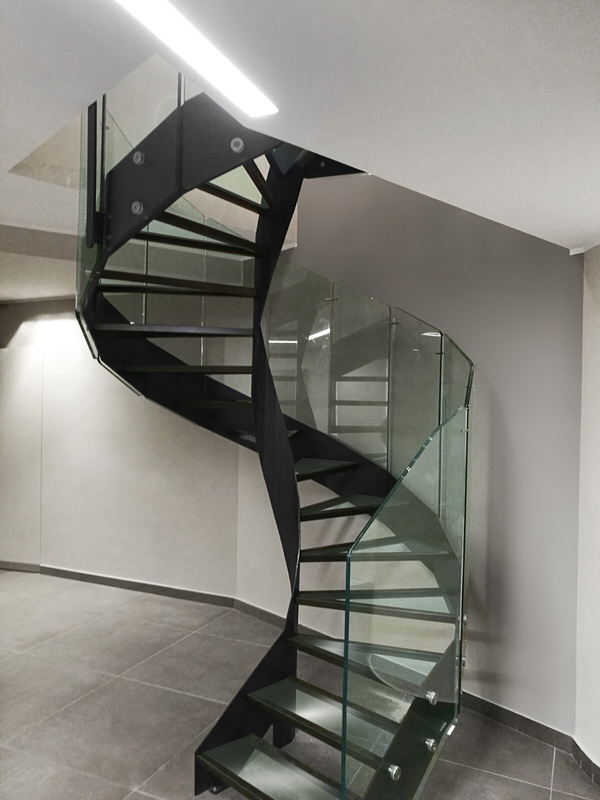 An option that makes it a real tailored stair, whose elegant spiral shape is valued at best by the transparency of an extra-clear glass railing. Today we are presenting to you a project realized for a private residence in Italy. 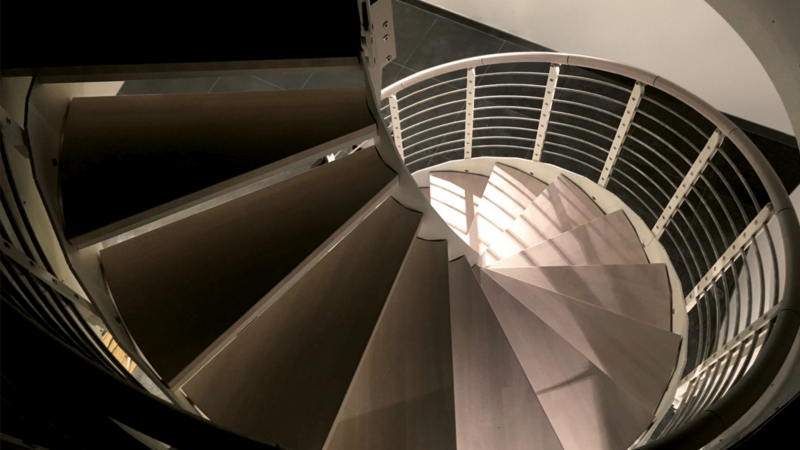 The customer opted for a Line helical stair (one of the most popular steel stairs in our collection) with wooden steps and soft white shade finishes, matching the color of the steps: an interior design stair conceived to fashionably decorate the home space. It is always a pleasure for us to contribute to make the environment of your daily life more and more refined and comfortable. And by the way… MERRY CHRISTMAS AND HAPPY NEW YEAR!